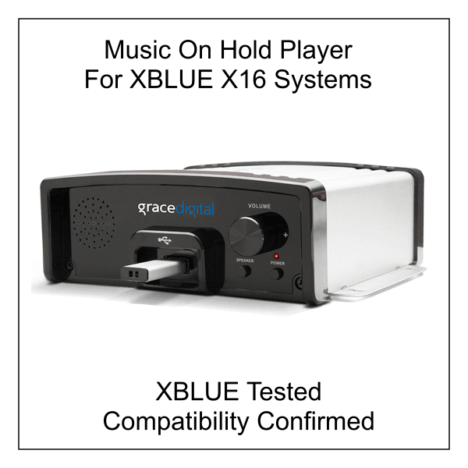 The Grace Digital Music On Hold (MOH) player provides easy, do it yourself operation for XBLUE X16 systems. Included with the player is a USB drive that has 6 hours of royalty free music. The USB port on the player allows you to use the included drive or your own drive with your own selection of music or messages. Setup Simply connect the Audio Out port on the player to the MOH port of the X16 server using the included cable. Connect power to the player and select External Music in the X16 System Setup programming. You can find detailed information at X16 Music On Hold Setup.